The Monster faced the Justice Society of America in 1944. In many ways he was just a Jekyll/Hyde variant, but he had a memorable je ne sais quoi. Plus, it’s not like there were that many JSA villains during the war. 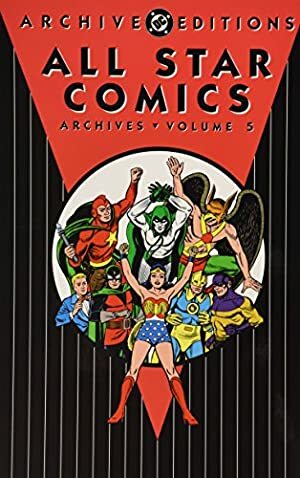 All-Star Comics was quarterly for much of its existence, and thus had but 50-ish issues between 1940 and 1950. Though the stories were one-and-done, the way the Monster is presented allows for casting him as one of the big criminals of the 1930s and early 1940s in the DC Universe. He could credibly be cast as a Fu Manchu, Moriarty or Keyser Söze figure, given the material. He also easily could have worked with the Hand. Known Relatives: Unnamed sister-in-law (deceased), Jason L. Rogers (twin brother). Group Affiliation: Leads his own criminal crews. Eyes: Dark red. Hair: Dark brown. “Maniacal strength” which seemed to be in the “Class 5” or even “Class 10” range. He could easily bend a crowbar with his bare hands, or take down most JSA members with one punch. Startling physical speed and accuracy. He could match the best fighters in the JSA, and perform superhuman feats of athleticism. Great technological mastery and inventive genius. Solid criminal experience, including recruiting and leading his own armed criminal crews. 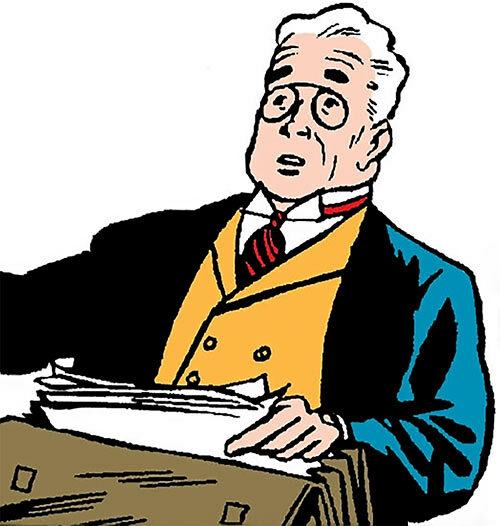 Superior intelligence and planning ability, though he had an odd tendency to forget the JSA’s abilities. He also was a good driver, pilot, and gunman, and knew how to handle explosives. A flying saucer-shaped helicopter. It had a powerful winch from which hung a huge electromagnet. This was used to steal large safes by magnetically attracting them through walls. A powder that, when heated, became a sleep-inducing gas. He’ll usually be accompanied by three or four triggermen with .45 handguns, with one having a tommy gun. The Monster was a person born without a conventional body. Instead, he had something that Dr. Mid-Nite called a “fourth-dimensional body”. Apparently, this means that the Monster existed in the same space as his twin brother Mr. Rogers, but in another dimension . Yet certain combinations of photographic film and infrared lights would produce the image of the Monster when filming Mr. Rogers. Furthermore, the Monster could take over his brother’s body at any point. Mr. Rogers’ body would morph into the Monster form, and his mind would go blank whilst the Monster was in charge. The Monster could take a blow from the Thunderbolt (STR 18, in DC Heroes RPG terms). Yet he could be felled by the punches of Dr. Mid-Nite or the pre-irradiation Atom. This isn’t mathematically impossible, given enough assumptions about luck and Hero Points . And in 1940 stories, such low probability events that feel quite forced happen all the times. Still, we’ll assume as a No-Prize Hypothesis that the Monster was specifically resilient to attacks from supernatural beings. Even a strange all-out attack by the Thunderbolt only dazed the Monster, and he was oddly confident when facing the Spectre. In this hypothesis, this is a normal consequence of having a “fourth-dimensional body”. Whatever that is. It is also possible that the Monster could harm supernatural beings, beyond what his strength level would suggest. But this is too tentative for inclusion in the game stats. Jason L. Rogers was a major American industrialist during the 1930s and 1940s. Back in 1941 the Atom did not recognise him, but in 1944 the Sandman, Hawkman and and Starman all knew whom Rogers was. A simple explanation is that the Atom wasn’t big on business news. But it is also possible that Rogers made much of his fortune from government contracts after the Pearl Harbor attack. During the early 1940s, he became known as a financial wizard. In 1929 and 1930, Mr. and Mrs. Rogers were living the upper-class life of his time. They seemed to have fared well even after the Black Thursday crash . Jason Rogers’ hobby was photography. Thus, he decided to film a picnic with friends, using advanced film – and infrared lighting to develop it. This film captured Mr. Rogers changing into the Monster. However, Rogers himself couldn’t see this, as his eyes couldn’t perceive certain IR frequencies apparent to most other persons. Thus, he didn’t see anything special when watching the film. But Mrs. Rogers did. Her panic at seeing her husband’s grotesque visage led to a heart attack, which took her life after a coma. Mr. Rogers’ society friends all deserted him after seeing the picnic movie. Unable to understand what was going on, Mr. Rogers moved to a new city and concentrated on his business. He didn’t make any new friends. After the picnic movie was shot, the Monster started manifesting and attacking the Rogers holdings. It is possible that being filmed is what taught the Monster how to take over Rogers’ body. The Monster was Mr. Rogers’ twin brother. Since he had somehow been born as a fourth-dimensional being, the Monster reviled his brother. He considered that he had stolen his body. Apparently, the Monster initially focused on harassing his brother’s companies – stealing payrolls, killing watchmen, robbing valuables, etc..
Howbeit, the Monster broadened his activities over the years. He became a successful, if haphazard, crime lord committing spectacular heists. Many of his crimes had a gratuitously evil angle, such as stealing from charity. His most intricate known plan was to drug a genius surgeon, to have him botch a vital operation on a VIP. Once the surgeon’s rep was broken, the Monster forced him to take part in one of his nefarious rackets. They kidnapped wealthy men, horribly distorted their features using surgery and a special chemical. The criminals only restored their appearance once an enormous ransom had been paid. The JSA kept watch for the Monster for months, but never made progress in apprehending him. 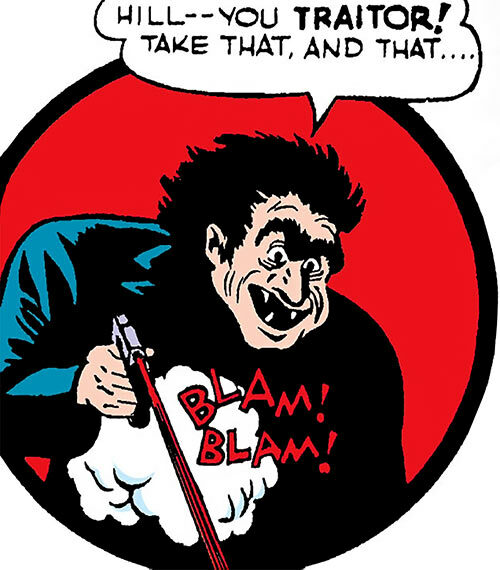 In 1941, the scheming Per Degaton used the Monster as a minor agent in an attack against All-Star Squadron members. 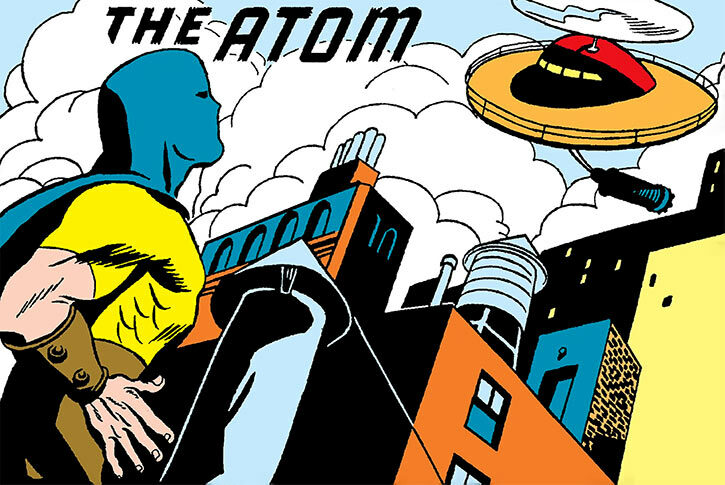 This hit was foiled when Dr. Mid-Nite spotted him in the darkness, and the Atom took the Monster out. The Monster briefly reverted to being Mr. Rogers then vanished, thanks to Degaton’s teleportation tech. During this brief incident, the Monster seemed much weaker than he would later be. Why the JSA didn’t recognise Mr. Rogers when they briefly saw him is also uncertain. As the Monster’s activities kept escalating, Mr. Rogers obtained an appointment with the JSA. Incensed by this, the Monster had Mr. Rogers find his entire plans. That was both a show of confidence, and a means to draw the JSA members into traps. 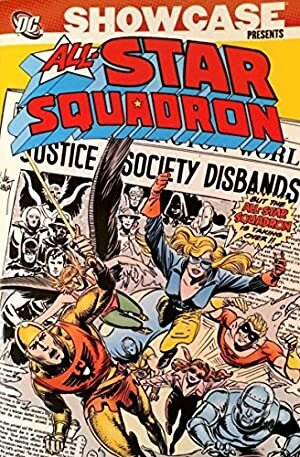 Also confident in their abilities, the JSA took the bait. Replacing steel baron Harlan Walsh with his crooked twin brother. Harassing Jason Rogers’ only remaining friend, Walter Noonan, by dynamiting the buildings, dams, etc. Noonan had designed. Using an UFO-like helicopter and giant electromagnet to steal large safes through walls. Murdering the crooked doctor the Monster had been running his disfigurement scheme with, after the physician sided with Dr. Mid-Nite for redemption. Gassing unconscious the public of a charity event at a planetarium, to rob them. 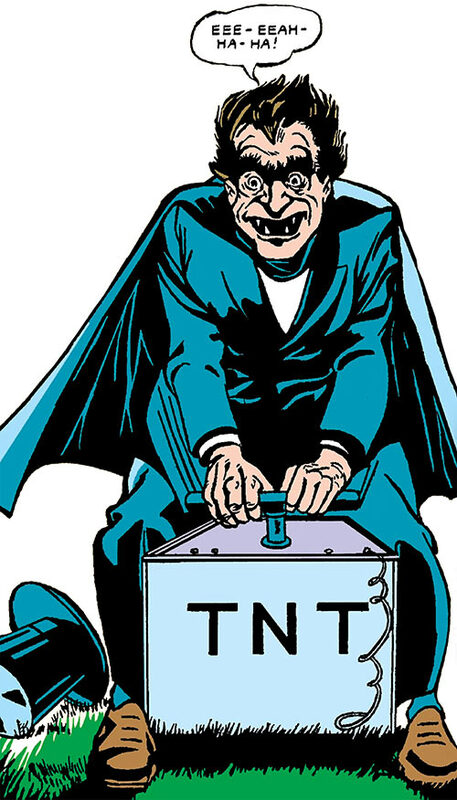 Robbing a jeweller, and using laughing gas to incapacitate those within – as well as responders such as the police and Johnny Thunder. During these capers, the Monster avoided direct confrontation with Society members. He preferred to sacrifice his men in delaying tactics than risk capture. Yet he grew tired of the Justice Society’s interference, and eventually attacked them all in their headquarters. He performed well, then escalated by producing a raygun to kill his foes quicker. However, a lucky kick by Johnny Thunder resulted in the Monster fatally shooting himself in the face. Oddly enough, the Monster’s clothing also changes when he possesses his twin. The Monster always wore a dark Victorian suit, with a hip-length cloak and a top hat. This is reminiscent of pop fiction depictions of Mr. Hyde, and also done for Marvel’s Mister Hyde. The Monster is big on sinister, evil, over-the-top laughs. The Monster is capital-E Evil, exulting in misery and destruction. Many of his schemes rely on blackmail and terror, but he also does plain old robberies to finance the growth of his mob. He seemed to be driven by raw hatred and resentment, particularly toward his twin brother. This likely slowed the development of his gang. However, by 1944 he seemed to be growing past this stage and more toward a “Napoléon of crime” thing. But it wasn’t clear. The Monster also occasionally acts in an impulsive, aggressive way. But most of the time, he’s cautious and thinks strategically. 1940s story conventions (and the specific story format in All-Star) resulted in odd tactics from the Monster. He avoided confronting the likes of Dr. Mid-Nite or Starman, but unhesitatingly brawled with the Spectre. He would leave dangerous opponents alive and unharmed when finishing them off would have been trivial. His fight-or-flight decisions alternated between excessive caution and bestial aggression. “Hee hee ha ha, fooled you ! There he is, men ! SHOW HIM NO MERCY !” (more theatrical evil laughin’). Both fields are Self-Only and Can Attack Thru. Force field only vs. Physical attacks from magical beings (such as the Spectre or the Thunderbolt). Expertise (Underworld lore), Iron Nerves, Lightning Reflexes. .45 handgun [BODY 03, Projectile weapon: 04, Ammo: 08, R#03]. SAUCER-SHAPED HELICOPTER [STR 10 BODY (Hardened) 08, Flight: 07, R#02]. The high STR includes a powerful winch, allowing this vehicle to serve as a sky crane. When seen the payload was an electromagnet with about 11 APs of Magnetic Control (only to attract ferrous material). Raygun pistol [BODY 01, Energy blast: 09, Ammo: 04, R#04]. This was but briefly seen, so the stats are somewhat arbitrary. The Force/Magic Field setup isn’t thoroughly supported by the material, but explain discrepancies. It is also vaguely conceivable he has dome APs of Sharpness for his STR, only usable against supernatural creatures. I’ve used Mayfair-style blocky Skills, since the Monster is an omni-competent Golden Age character. No fancy stuff about his “fourth-dimensional body” using Self-Linked Personality Transfer or whatever. This is in keeping with our most common methodology, which is evidence-based and effects-oriented. In practice, his “fourth-dimensional body” is just a fancy Secret Identity. The Monster once makes a superhuman jump. But as our contributor Sean noted in his Spy Smasher profile, it is common in 1940s comic books for heroes and villains to make incredible jumps. I think this is better-addressed by Genre-specific Acrobatics rules, but Jumping: 01 would also work for the Monster. Source of Character: Action Comics Vol. 1 #82. Writeup completed on the 25th of April, 2018.